Having a husband that actually enjoys strolling through antique shops with his wife is a blessing and I'm so thankful. While we were out last Saturday I spied some blue and white. and the price was perfect...yippee! They are Blue Onion Japan canisters, customized pieces imported from Japan by the Arnart company in the 1950's. No great find of monumental value, I just love the style. Other pieces, like the sugar, tea, coffee, start tapering down in size. There are lots of pieces that can be added to this collection in addition to the canisters. 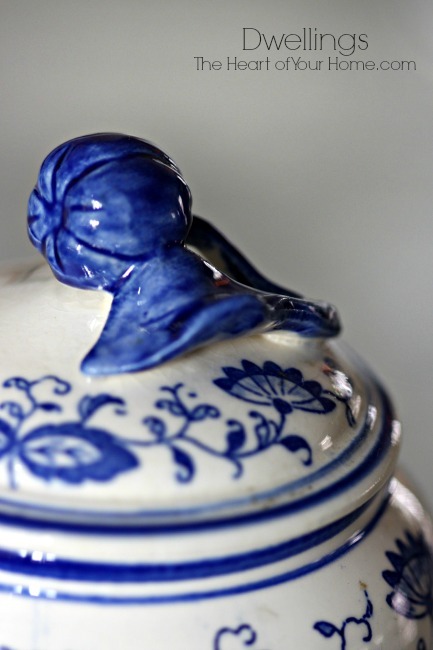 I've placed them near Granny's blue and white teapot and the glass front cabinets with my blue and white dishes. I'll be keeping my eye out for other pieces...the thrill of the hunt, right? Aahhh the thrill of the hunt! Beautiful find! Love your blue pieces. Blue and white are just hard to resist. I also love that little candy dish rooster. That is the second time you have had something that I have. I always try to look for those usual pieces that are different than others:) I think we must have similar tastes. I purchased it because it reminded me of my grandma. She ALWAYS had a candy dish out with candy for the grandchildren. The first time was the rooster that you had pictured on your island, I believe. It's beautiful! I don't take it for granted either that my husband enjoys strolling and tagging along with me. That is the most fun part about going for me. Pretty finds Cindy...I would have snatched them up too! I remember the days when hubby and I used to do that. It's been a long time. They look beautiful in your kitchen, Cindy. My hubby and I spent part of today antiquing together. So pretty ! 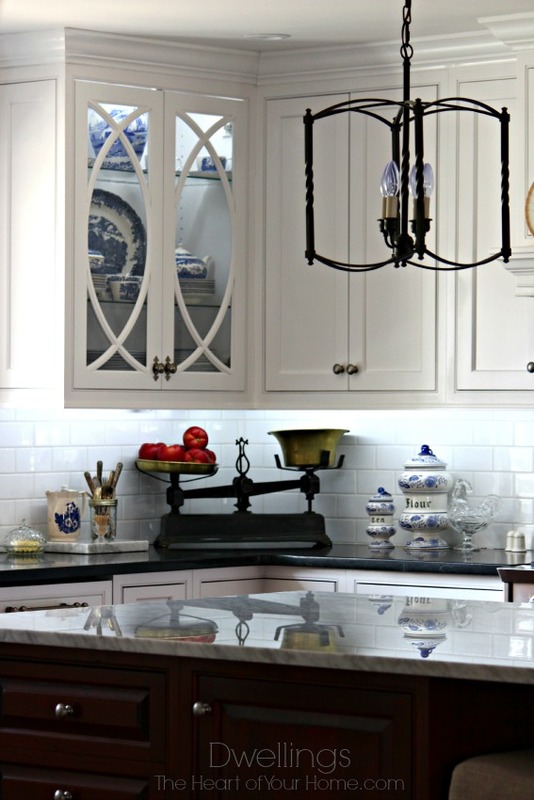 Love the cabinet with your transferware! You are so right, Cindy! It's all about the hunt and your new finds are gorgeous!! What a wonderful find! 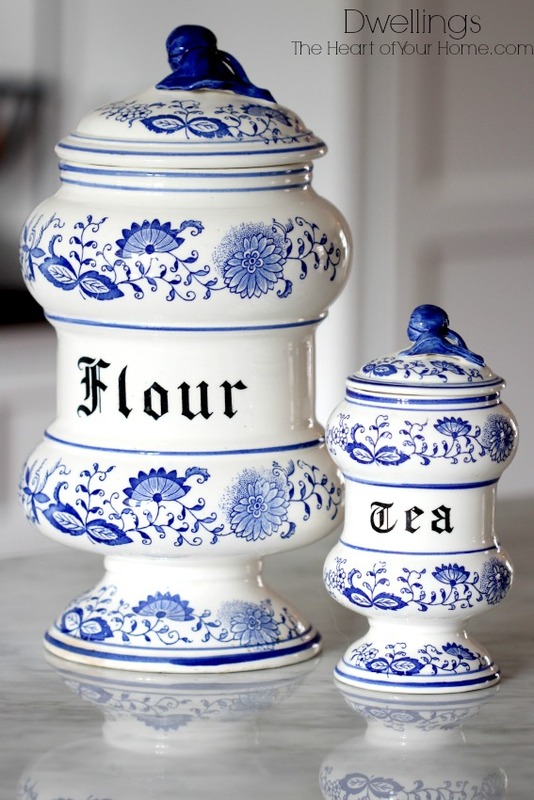 I love all things blue and white, and they look perfectly at home in your pretty kitchen. Love them! I have my grandmother's set. It was a gift from my mother so it's extra sentimental to me. Blue and white always looks pretty doesn't it! It is a beautiful set, but I'll a little partial I have the whole set, found it down in TN. They are sitting in a cabinet, and maybe I should pull them out. They look lovely on your counter top! Just gorgeous! You know I love blue and white too. As for size, I think that the cookie jar should be the largest! You never want to run out of cookies. Gorgeous! they would go perfect in my cobalt and white kitchen too! I just LOVE those beautiful blue and white pieces!! I didn't know Imari made blue and white pieces. I will start looking for it. Where did you get your beautiful scale??? Your kitchen is beautiful, Cindy, and what lovely treasures you found. I am lucky that my hubby enjoys antiquing with me also. Truly a blessing. Wow...I say that it was a most fabulous find!....I am lucky too in that my hubby does not mind strolling the shops with me..he often spots things that I had overlooked....nice to have another set of eyes when you are shopping....the pieces look great in your magnificent kitchen! I have a set to sell. 6 cannisters: cookies, flour, sugar, coffee, tea, jelly. Hi, Cindy! 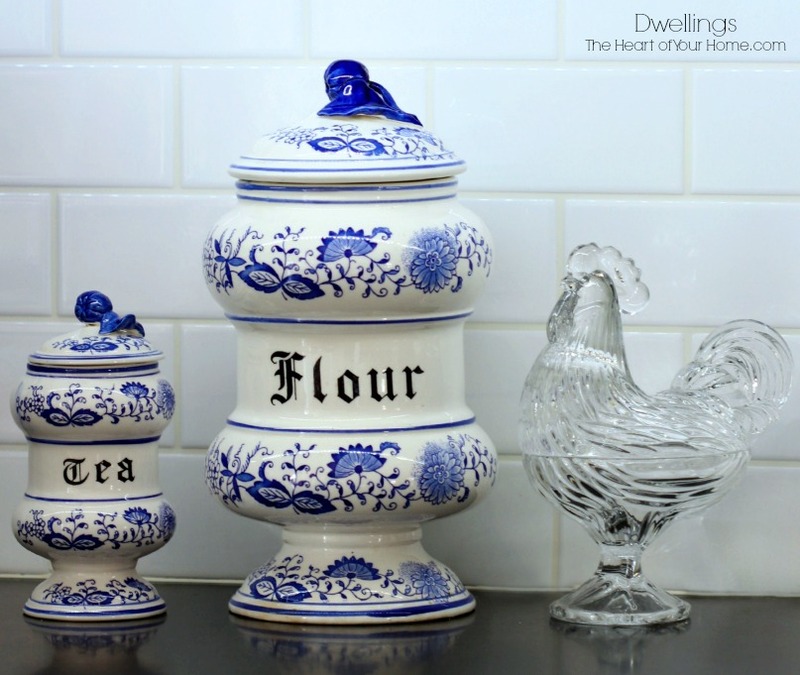 I just discovered your wonderful blog and love your blue and white canisters. Just this week, I saw a few similar canisters in a thrift store, but they were a tan and white, same shape. They really caught my eye due to the shape and I didn't buy them but may go back for a second look. Have you seen your collection in the tan and white? Thanks so much for sharing! i have aset of 3 flower pots from a price japan with the same flowers and same color.i found in a old empty house been sitting for years, iv had them at least 15 years that i remember now.